PostProcess announces their latest innovation, the new automated and intelligent FORTI™ support removal solution. The FORTI leverages PostProcess’ proven submersible technology already available in the CENTI and DEMI for consistent, hands-free support structure and resin removal on 3D printed PolyJet, FDM, SLA and CLIP parts. The FORTI was designed specifically to address the growing market demand for a software-driven system between the desktop-sized CENTI™ machine solution and production scale DEMI™ machine. 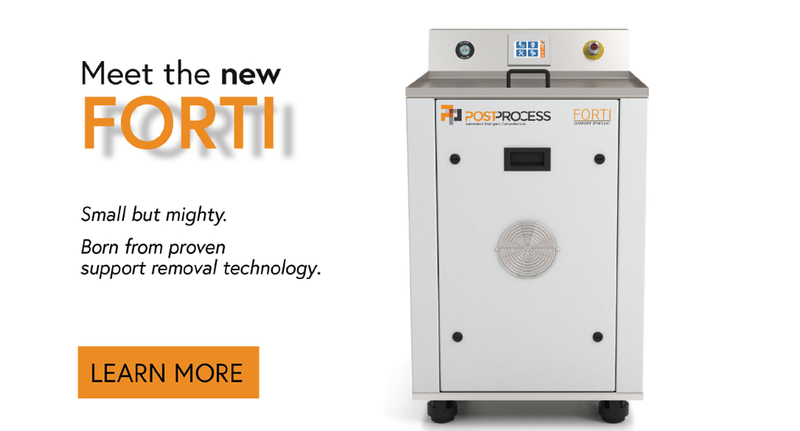 Just like its big brother, the DEMI, the FORTI is enabled by PostProcess’ patent-pending AUTOMAT3D™ software platform. Designed within the family of submersible support removal solutions, the FORTI’s highly engineered Submersed Vortex Cavitation (SVC) technology utilizes advanced ultrasonics, heat and fluid flow in concert with PostProcess’ proprietary additive formulated chemistry. An advanced pumping scheme creates vortex action to optimize the rate of removal of the support material and minimize buoyancy issues to virtually eliminate damaged parts. – See the FORTI’s Specs. – Check out the full lineup of Support Removal Systems.